Access control lists (ACL) serve to limit users’ access to the web interface Centreon via miscellaneous rules. The ACL are also used to create multiple user profiles making possible to focalise on a precise set of resources. The management of access checks is a function specific to Centreon, the export of the configuration to the monitoring engine is not necessary to enable them. A user can belong to several access groups thus making it possible to add together all the access authorizations. Centreon administrators are not subject to ACLs (property of the contact). A user (non-administrator) who does not belong to any access group has no right on the monitoring platform (screen empty after logging in). The ACLs are recalculated every minute; this why it is sometimes necessary to wait a few seconds before seeing the change applied to the profile. The addition of additional modules to Centreon sometimes makes it possible to add additional filters to the access groups. E.g. : Centreon modules BI, BAM and MAP can be subjected to filters. 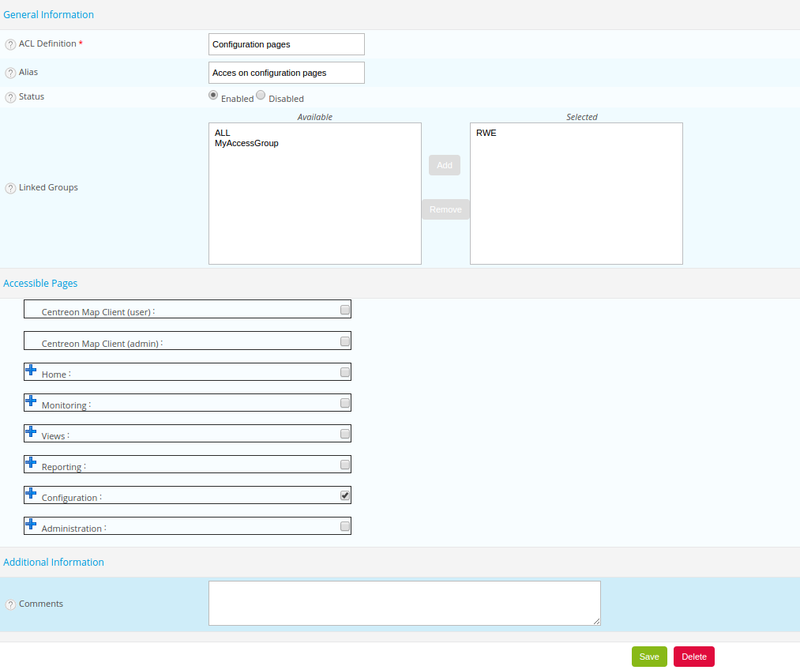 The contact group can be groups coming from the LDAP directory connected to the Centreon interface. Groups created in Centreon interface should not have the same name as LDAP groups to avoid problems. The lists presented in this tab can be used to link the various types of access already created to the access group. The access filters for the resources serve to limit the viewing of objects (hosts, host groups, services and service groups) to a user profile. Once the filters on the resources are set, you can to view the result via the menu: Check User View, next to the add option. If the Include all hosts or Include all hostgroups box is checked, all newly created objects will be added to the filter automatically. It is possible to explicitly exclude hosts from the filter (useful in cases where only 1 or 2 hosts must not be part of the filter) if Include all hosts* or Include all hostgroups options are checked. 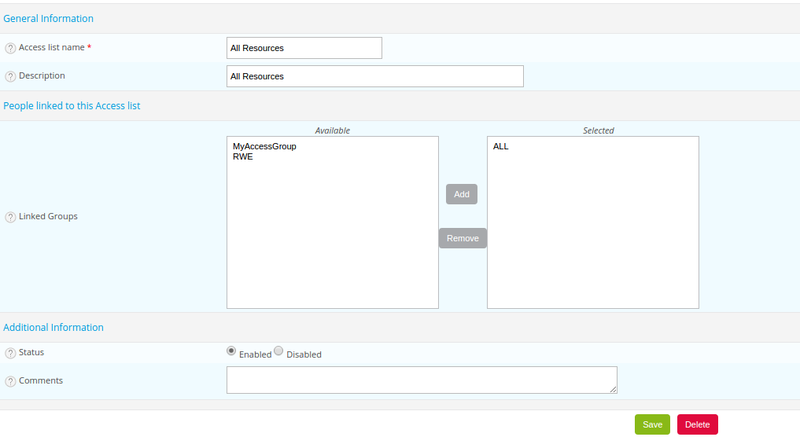 The Services Resources tab can be used to add service groups to the filter. The Meta-Services tab can be used to add meta-services to the filter. The filters by poller or by category of object are inclusion filters (UNION). 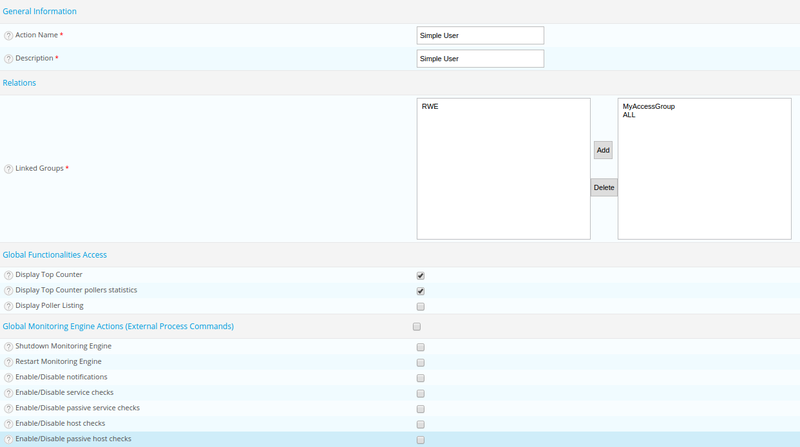 Only the objects belonging to these filters in addition to groups of objects (hosts and services) will be visible. To access to a level of menu ‘n-1’, the user must have access to the menu of level ‘n’ otherwise he will not be able to view the menu via the interface. If this is not the case the user will have to access directly to the page concerned via a direct link (autologin, etc.). On the access definition to the Configuration > Hosts and Configuration > Service menus, it is possible to give read only or read / write access to various objects. 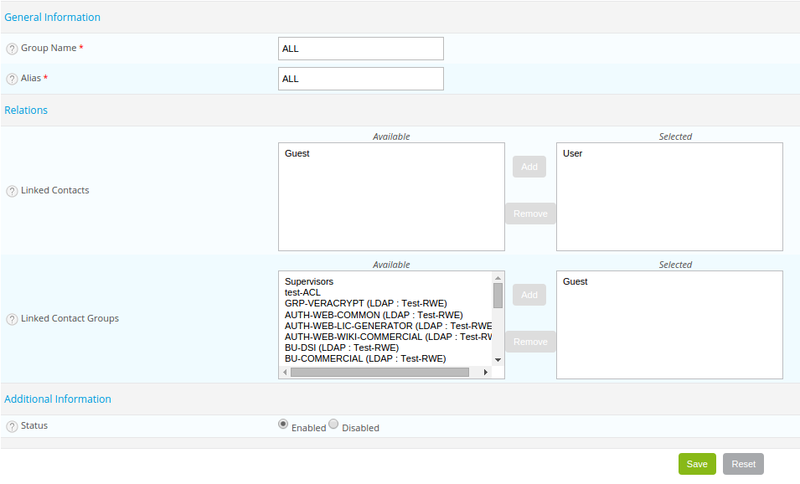 At each addition of a new Centreon module possessing a web interface accessible via a new menu, it should be added in the access groups so that the users can access. Filters on actions enable us to limit access to actions that can be effective on resources (hosts and services) and on monitoring engines (stopping notifications, restarting the scheduler, etc.). Display Top Counter pollers statistics The monitoring poller status overview will be displayed at the top of all pages.